This dramatic hamper has a real sense of theatre and is guaranteed to blow your recipient away when it's delivered. Featuring some of the most delicious products from well respected artisan makers including chocolates, Christmas pudding, preserves, biscuits and so much more. 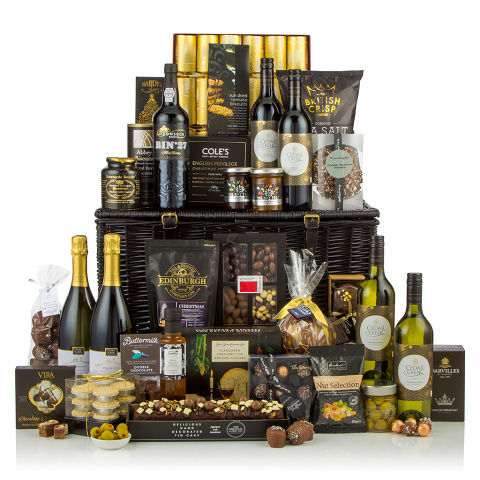 Two bottles of the most delicious Prosecco as well as two bottles of Shiraz, two bottles of Chardonnay and a Port have all been packed in to the striking black willow hamper basket to ensure your lucky recipient has plenty to toast with over the holiday season. A truly unique and stunning hamper that cannot be missed.